If you're looking for something to pass the time with your kids in the car (or even at home! 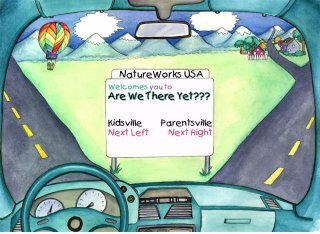 ), you must get "Are We There Yet" by NatureWorks USA and Oblio productions. AWTY is an hour-long, audio program that helps parents stay sane by keeping 6-9 year olds "edutained" with acted out stories, toe-tapping music, jokes, goofy characters and laughs. My 8 year old loves this CD while working on the computer, riding in the car, or playing games at the table. The AWTY website is filled with fun, games and information about this CD! Please stop in for a visit to help support AWTY and Busy Parents Online Magazine.